This is an interview with Jackie who teaches ESL at a university in Busan, Korea. Where do you currently live in Korea? What drew you into teaching English in Korea? What qualifications do you need to teach in a university in Korea? Does your university provide free housing or an allowance? How did you find your housing? What is a day in the life like for you including your work day and life outside that? Paddleboarding sounds fun. Which beach do you usually go to? Do you ever hang out with your students or is it just more of a formal relationship? Did you always teach in a university? How long have you been in Korea? Are you planning on staying in Korea for the long term? What's the most difficult thing about teaching university students? Do they talk much? I’m originally from Canada. I grew up in Edmonton, and went to school in Calgary and Vancouver. I live in Busan, which is the second biggest city in South Korea behind Seoul. It’s a beautiful port city filled with beaches, mountains and a lot going on for both Koreans and expats. I moved here about 3 years ago, but before that I lived in Cheonan, a medium sized city about an hour south of Seoul. I lived on my university campus surrounded by rice fields and mountains. It was peaceful and relaxing. I had a campfire pit, garden and a BBQ area by the lake, but I got tired of having very few foreigners around, so I decided to move to a bigger city. Like many people, I decided to teach English abroad because I had some student loans to pay off, but I also wanted to travel and experience Asia. The original plan was only for a year, but I loved it and have stayed 9 more. I decided on Korea because 10 years ago, it was very easy to get a job here using a recruiter - much easier than Japan which was my first choice. Once I got here, I networked my way into better and better jobs which made it hard to leave. These days however, the government has tightened up the regulations, so the paperwork can be quite time-consuming and expensive. First of all, you need the basic qualifications that anyone would need to teach English in Korea: a university degree, clean heath and criminal record checks and a passport from an approved country. Beyond that, university jobs are quite difficult to get because conditions are so good. For 10-15 teaching hours per week you can often get a package of around $3000 USD per month (salary + housing allowance), which comes with 5 months of paid vacation. In order to compete, you’ll need a master’s degree of some kind, with one in English, education, or TESOL being preferable. At least 2 years of experience teaching adults helps as well. Many jobs are filled through personal connections, so a large network can be quite useful. I knew a couple of people who taught at universities in Korea with only a bachelor's degree, so it seems like a master's isn't mandatory in all cases? Of course, there are definitely people who only have a bachelor's degree working at universities as well. Most of these people got their jobs 5+ years ago when the job market wasn’t so tight and got “grandfathered in.” These days, it’s far more of a rarity and someone with a master’s degree and no experience teaching adults will find it tough to break in. This one varies by university. At my old one out in the countryside, I was provided with quite a nice one bedroom apartment in a building with the other foreign teachers. At my new job in Busan, I’m given a housing allowance of $350 USD and I had to find my own housing. It really does vary a lot, but as a kind of general rule, universities in Seoul and Busan will offer housing allowance while places outside of those cities will provide housing. However, even if the university does provide housing, you can often choose to take a housing allowance instead. In the bigger cities, there are English speaking real estate agents or landlords who speak English and cater to foreigners so it’s pretty simple to find what you’re looking for. In the smaller cities, this can be more difficult and you either need to speak Korean, have a friend go with you, or pay someone (a student?) to help you out. The whole process is reasonably simple though and you will be able to find something 2-3 weeks before you want to move in. Things are a bit different in Korea in terms of the way the rental housing market works. It’s normal to pay huge deposits and then a lower monthly rent. If you have a deposit of $100,000 USD or more, you likely won’t have to pay any monthly rent at all. In my case, I put down a deposit of $10,000 USD and pay $500 a month in rent for a nice, 3-bedroom apartment with a beautiful view close to work. I even rent out my spare room on AirBnB to help pay a portion of my rent. It is possible to find places with a lower deposit but they’re more likely to be studio or loft apartments and not something suitable for a family. I’m fortunate to have a job where I only have 9 contracted teaching hours per week, which usually means 3 days per week. However, I try to fill in the gaps with overtime opportunities and generally teach about 20 hours, so I can be quite busy, especially at the end of the semester paperwork crunch. These days, most of my teaching hours are in the afternoon/early evening but I’ve also had schedules that involved 9am classes most days. I generally wake up pretty early at around 7:00, drink some coffee, eat a bit of breakfast and then go do something outside before work. 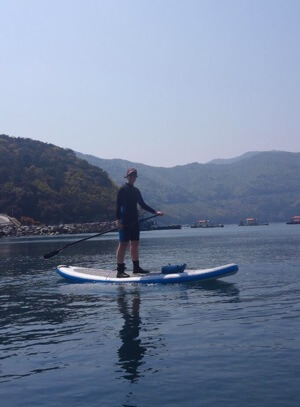 Depending on the season and the weather, it often involves biking the Nakdong River, hiking up one of the mountains outside my front door, or taking the stand-up paddleboard out to catch a few waves at one of the local beaches (one of the best things about Busan is the mild climate). Then, I come home, get ready for work, eat some lunch and am usually in my office by 1:00. My first class will generally be at 2:00, and some days, I might be finished by 4 or 5 while others I’ll teach until 8 or 9. The gaps in the day are usually filled with lesson planning, grading, or working on my various online ventures such as writing books or developing websites. 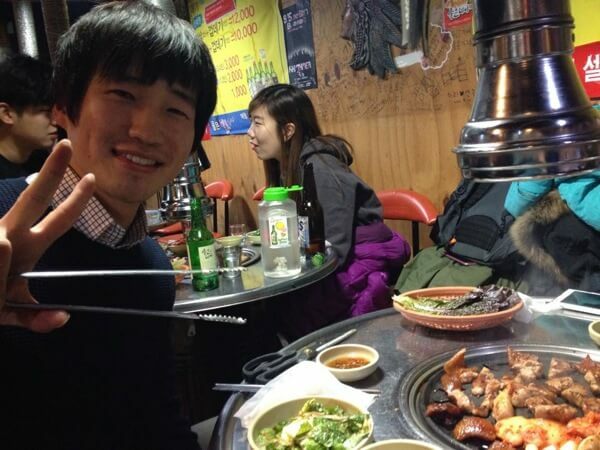 At night, I’ll often meet up with some friends for dinner. As far as classes go, I teach only English majors these days so I have excellent, motivated students. I teach academic writing which is kind of intense. Korean students have never learned about thesis statements, topic sentences or organizing their thoughts even in Korean so it really is like starting at ground zero! But, it’s rewarding and I feel like I can give my students a solid skill that they can use in the future. Busan is kind of a paddleboarding paradise. The best surfing beach here is Songjeong, but it’s the one furthest from my house. I go to Dadaepo Beach usually, which at times has some surprisingly good conditions. The best part is that I’m often the only one out on the water and the lifeguards are far more chill than at the more popular beaches like Haeundae. If I just want to go for a relaxing paddle, I’ll often go on the Nakdong River, which is close enough to my house than I can see it out my window! I’m all about maintaining a more formal student-teacher relationship and will never hang out with students outside of work. That said, if I have a small class of 10 or less, I’ll definitely bring them out to a coffee shop or for an ice cream as a break from studying. At the end of the semester, I’ll often buy them dinner and a few drinks to celebrate. I strive for friendly and caring, but professional at all times. Korean students seem to respond pretty well to this. I got my start in Korea at a hagwon (private language institute). I went back to Canada for grad school and spent that whole time missing Korea, such that I decided to come back for round 2. Through an old friend, I got a much better hagwon job, and then used the connections I made during that year to get a great university job. Most people in Korea get their start at either a hagwon or public school because it’s difficult to get university jobs from abroad - most places want in-person interviews. However, you really need to be wary of hagwons - many people do get ripped off. Teachers need to be aware that they’re places of business first, educational institutions second. Public school jobs are usually much better than hagwons, but the government seems to be systematically cutting these positions lately. I’ve already been in Korea for a decade, but have decided to return home to Canada in March 2016. I want to be around my family and live in a place where everything makes sense to me! Teaching in Korea is kind of a dead-end job with no room for advancement into management, so it’s not a great place to teach if you’re ambitious like me. I want to work somewhere in a job where my hard work gets rewarded because Korea certainly isn’t that place. I always had in the back of my mind that I’d enjoy the easy living that working in a Korean university brings for a few years, but that it wouldn’t be my life forever. The most difficult thing about teaching university students in Korea is trying to overcome their previous language education which has largely been ineffective in terms of actually being able to communicate. Koreans learn English in elementary, middle and high school strictly for their version of the SAT that they take at the end of high school in order to get into college. It has no spoken or written component and so as a result, Koreans are usually pretty competent at reading, listening, vocabulary and grammar, but they are terrible at speaking or writing. When they get to my class, they are used to being totally passive learners and expect that English class will be lecture-style. I refuse to do this because it’s a terrible way to learn a language and instead employ more communicative, task-based learning techniques, so it can sometimes be a battle of wills. You actually want me to talk with partner? I really have to stand up and survey 10 of my classmates? Lately, it’s not a big deal because I teach better students, but trying to get 30 engineering students active and involved in a Monday morning 9am class can be extremely trying and it’s not a position I ever want to find myself in again. Class sizes can really vary. At my first job, I had 40 or more students in my freshman English classes which was pretty terrible. These days, my classes are capped at 24, which is a much better number for a writing or conversation class. Some classes, like my evening classes have far fewer - usually around 10 or 12. Overtime classes that are optional for the students can have even fewer. Jackie Bolen has been teaching English in South Korea for the past 10 years and is currently working at a university in Busan. You can learn more about her at her blog.